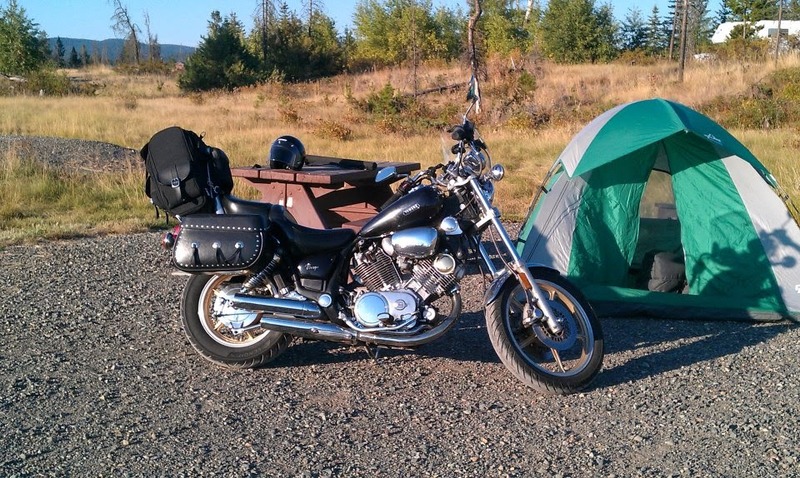 A one-man odyssey of a trip from Vancouver, BC to St John's Nfld on a motorcycle. I met 4 nice folks in the next campsite who rode in for the night. A squid-bike, a Triumph and 2 Harleys. Nice bikes, but too big for me. Triumph does seem like they're making a comeback, though. So, off to.... well, East. If the weather is as bad as they say, it will be Sudbury. Otherwise, maybe Barrie.But oh-oh... the oil light went on momentarily when I started her up on the side-stand. Now, Viragos have a strange oil light - it does NOT show oil pressure, just if you're low on oil. And if the bike is leaning, it goes on earlier. But this means I need oil. I have no problem finding gas on Manitoulin Island, but nobody had oil until I got to Espanola where there was a Canadian Tire will all the oil I needed. Still, it's been 5000 kms since it's been changed, so I should change it in Toronto when I get there. The weather is fine - quite war in fact. So... continue on to Barrie... and find there's VERY few gas stations on Hy 69! I ended up getting some Regular (the scoot runs on hi-test) at a campground. Then late lunch and proper gas at Perry Sound, and off to Barrie. Or what the heck - it's only another 100 kms to Toronto! Then I hit Barrie and traffic grinds to a halt. I'm dressed prepared for the "showers or thunderstorms" that were predicted, so I'm ROASTING. I end up pulling over and shedding at least a few clothes. Traffic thins out a bit, but it's still heavy - I guess all the Torontonians coming back from their cabin...err.... "cottages". I punch in "where's the nearest Super-8? on Herr Garmin, and he tells me. Unfortunately I take Exit 26 instead of Exit 27, and I'm on "the Expressway". Now, there's two things about an Expressway: 1. it's tolled, and 2. there are no pesky exits to slow you down. So I guess I'm paying some sort of toll for driving several kms down the Expressway until I finally found and Exit. The Super-8 in Concord (apparently I'm not QUITE in Toronto yet) is nice but quite a bit more expensive than others I've been in. Next day I'm off to Scarborough to find cheaper accomodations.